Pecans are not the easiest thing to find here. Most of the ones you find are smoked or salted or candied or something and not suitable for pie-making. Sarah did find them once at Aldi, but we’ve been prepared this time, somewhat, by importing a few pounds thanks to our Costco-membership-having friends and family on our last U.S. visit. 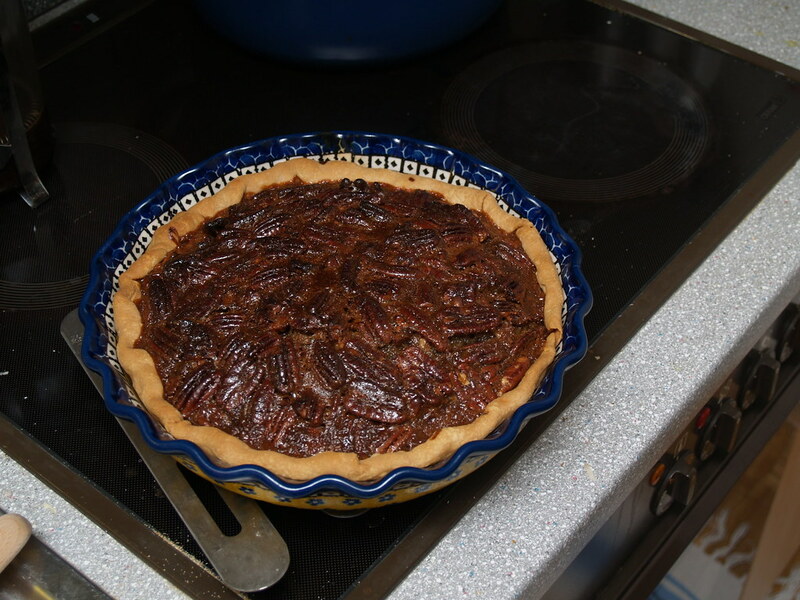 So, armed with those, we tried out a pecan pie. We took this recipe from epicurious.com used it mostly as-is, with the exception of the orange peel. It seemed dumb to me to only use one half-teaspoon of zest, so we put in the zest of a whole orange. That tasted great. Also, we backed off on the corn syrup somewhat (versus the original recipe), and I think we could have backed off even more. Preheat oven to 350°F (177°C) with a baking sheet on middle rack. Get yer pie crust into a 10-inch pie plate. Lightly prick bottom all over with a fork. Chill until firm, at least 30 minutes (or freeze 10 minutes). Our all-natural walk-in fridge (the little room between the hallway and our apartment) is ideal for this, but only some months of the year. Meanwhile, melt the butter in a small heavy saucepan over medium heat. Add the brown sugar, whisking until smooth. Remove from heat and whisk in the corn syrup, vanilla, zest, and salt. Lightly beat the eggs in a medium bowl, then whisk the corn syrup mixture into that. 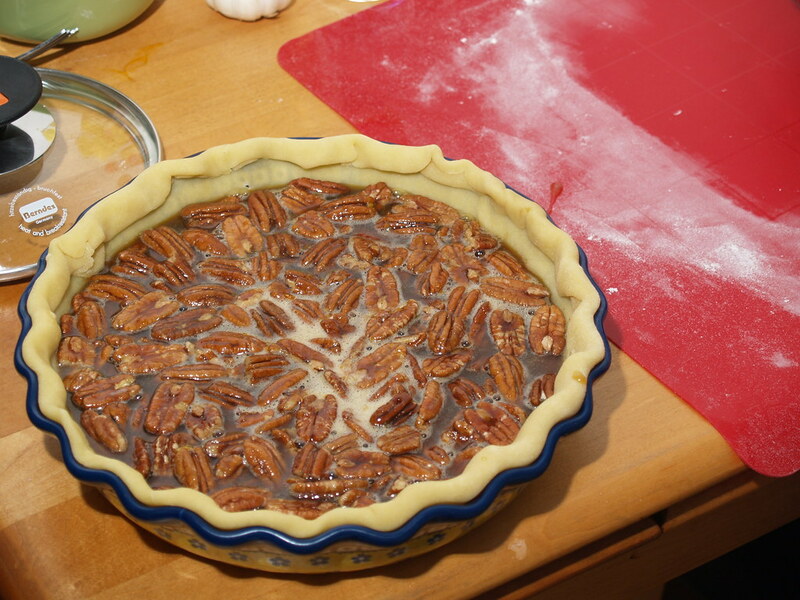 Dump the pecans into the pie shell and pour the corn syrup mixture evenly over them. Our pie plate was pretty deep, so we didn’t need to worry about syrupy eggy spill-over, but the original suggests baking on a hot baking sheet until filling is set, 50 minutes to 1 hour. Cool completely (go with the walk-in fridge again) — overnight is probably best. We’ve never been able to make a really good lemon bar. Maybe that’s not exactly right – we’ve never made a lemon bar that we’ve thought was perfect. Either the lemon mixture wouldn’t gel, or they were impossible to remove from the pan, or there was almost no lemon flavor, and so on. And we were following the directions to the tee, so we couldn’t understand what was wrong. So I stopped following the directions and started tweaking. I got this recipe from epicurious, but I’ll post what I did below. Preheat oven to 350°F (176°C). Put all ingredients in a food processor and run on medium until mixture begins to form small, pea-sized lumps. Pour mixture into 9×13 baking dish and press evenly onto bottom (a metal spatula is good for this – don’t use your hands! It’ll melt the butter and throw off the texture of the shortbread). Bake shortbread on middle rack for 20 minutes and prepare the lemon mixture. In a large bowl, whisk together eggs and sugar. Add lemon juice, zest and flour and stir until just combined. Pour over hot shortbread base and carefully return pan to oven, turning temperature down to 300°F (149°C). Bake for 30 minutes, or until just set in the middle. Allow to cool completely (preferably overnight), then dust lightly with powdered sugar. I love wrap sandwiches. When we’re anywhere with a Marks & Spencer food hall, I live on the things (mostly because those happen to be in England and it’s hella expensive there). So I wanted to try making my own. Here’s my first iteration – we enjoyed the results! Combine all salad ingredients in a bowl. Whisk together dressing and toss with salad. Spread desired toppings in a thin layer on a tortilla (sour cream, cheese, sliced avocado, etc.) and top with salad. This should be enough for 6 large wraps. While between jobs in Detroit, I worked for a few months at a place that served only soup – pretty good soup, too. They had one that, after I had decided it was my favorite, they quickly discontinued. With some help from this recipe, I hit on a pretty good replica. 1. Preheat broiler, position rack about 4 inches under element and line cookie sheet (use one with sides!) with foil. Cut the peppers into quarters and remove seeds and ribs. Place peppers on the cookie sheet skin side up. Roast the peppers for 15-20 minutes, until skins are mostly blackened. Using tongs, place peppers in a large ziploc (also, pour in any juices collected on the foil) to steam and set aside for 20 minutes. Remove peppers, peel blackened skins and chop coarsely. 2. In a deep soup pot, melt butter over medium heat. Add onion and garlic and sauté until tender and translucent. Add rosemary, tomato paste and paprika, stirring until tomato paste is well distributed. Add peppers and chicken stock, bring it all to a boil and simmer for 15 minutes. 3. Remove rosemary from the soup. Using a stick blender, process soup until fairly smooth and no large pieces remain. Add one cup of hot water to soup, stir well and bring back to boil. When boiling, add orzo and cook according to package directions. After orzo is cooked, turn down heat and stir in cream. Adjust seasonings and serve.